In this post: Sukkot celebration with three Fall crafts. Sukkot (The Feast of Tabernacles) was a special time this year. I was able to share the significance of this Biblical Feast with our homeschool group. Sukkot is one of the feasts that will be celebrated during the Millenial Kingdom (when Jesus reigns on Earth 1,000 years). Even Gentiles will go to Jerusalem to celebrate (Zechariah 14:16)! So I am fascinated by this holiday that we are all going to celebrate anyway. Tabernacles is like Christmas…once God wrapped Himself in flesh and came to Earth as a servant…soon Jesus is returning to tabernacle with humanity as the King of Kings. Tabernacles are tents. The Israelites lived in tents in the desert before they reached the Promised Land. Christians are living in fleshly tents but this world is not our home. One day my spirit will leave this tent and go to my TRUE Home. The Sukkah (tent for Tabernacles) reminds us of these truths. The decorated sukkah- If you check the link above you’ll see more of our Sukkah in the works. My hubby made this with PVC pipe and the kids and I decorated it. It was super hard to put together on my own. Thankfully my mom and a friend helped me and Michael. Here we are playing worship songs for the kids. Fall Soups and Chilis- Here’s Mom setting up the table. The homeschool moms brought their favorite Autumn soups and chilis. Worship and Dance- Sukkot is a wonderful time of worship. Usually, we worship under the stars but this day it was inside. I taught the kids an Israeli dance to the song “Open the Sky”. Sukkot is also a harvest festival. So we did a few harvest crafts. I put together the arms, hair, and burlap for the scarecrows. The children chose the clothes, hats, and buttons. They also glued on the eyes and drew the faces. We’ve made these pumpkins several years in a row. I still love making them. Edible Sukkahs- Inspiration found here. The kids made sukkahs out of graham crackers, icing, and Fall candy. Tot Farm- I put together a Farm sensory area for the littles. Spider Stacking and vegetable sensory bin in the Tot Farm. Michael and the too Cool for School Gang! Ha! The older boys in the group like to hang around and not get as hands-on with crafts. Michael is getting to that age. The boys were impressed with his musical skills so they congregated around him. My boy is growing up…sigh. 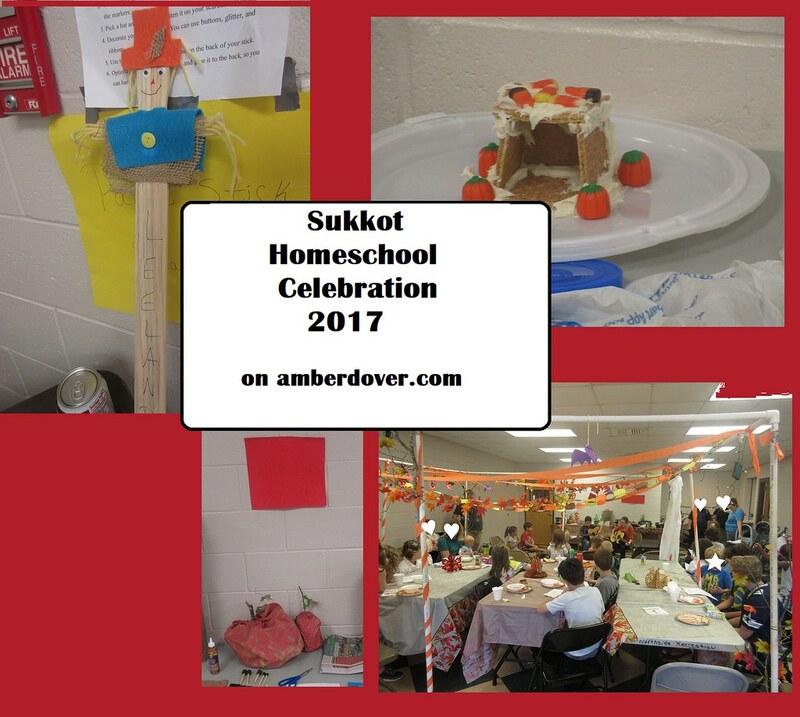 Do you celebrate Sukkot? What are your family traditions? You can learn about ours in the links below. God bless & remember the High King lives…and He’s coming again SOON!